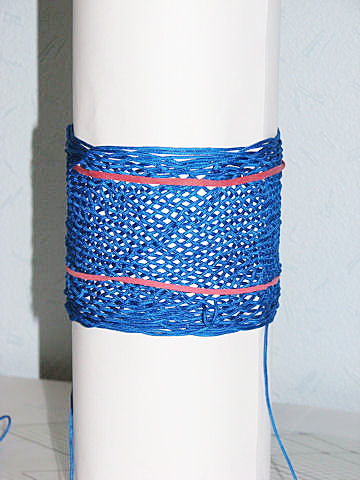 Picture of "proof in the cordage" will follow in time. [open quote] Charles, attached is a revised set of tutorials, plus a couple of new ones. 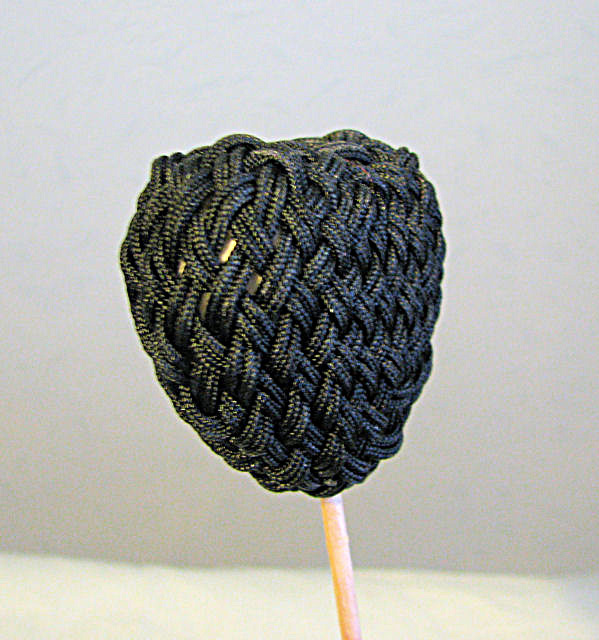 Charles, a 45 strand ABOK 3063 (in 4 colours 1.3mm cord), a 10 strand ABOK 3045 in 2 colours 2mm cord, a 17strand ABOK 3054 (in 2 colours 1.3mm cord). 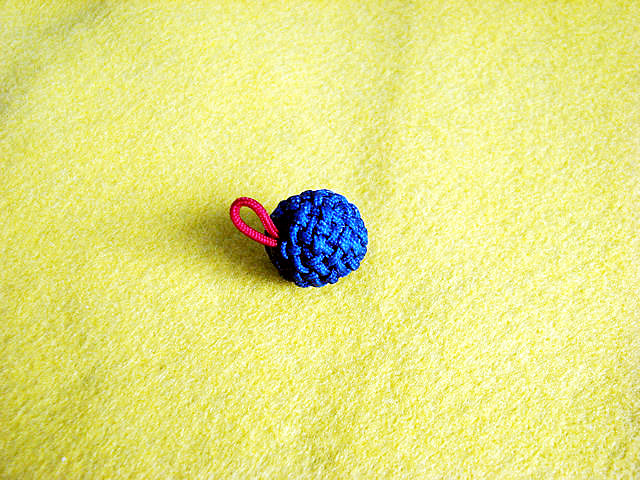 This is a new kop of cord that won’t dye so well as earlier cord. It is, I think, put through a coating process during manufacture. The earlier Jacquard Acid simply washes out and the new Jacquard dye doesn’t yield such intense colours. [open quote]Charles, I found a heart shaped polystyrene item in a hobbies shop. Used an assymetric grid. 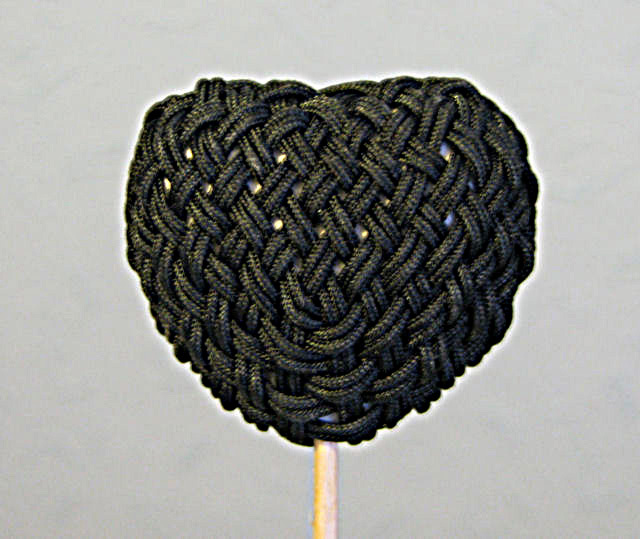 The black cord is 1.3mm dia, the heart shape is 50mm x 50mm and 20mm thick. Bit fiddley ! Charles, Very best wishes for Christmas and the New Year. The cone is 544facet, not perfect......note the gap at the cone apex. 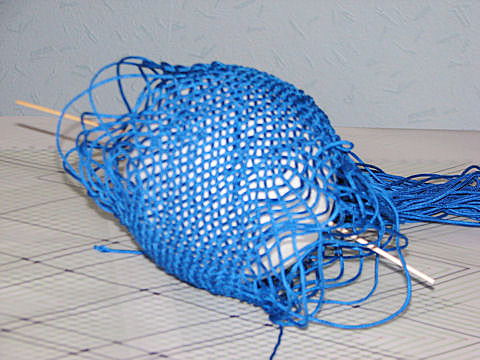 But the base is covered as well (the dark patch is too much glue on the cut ends............27metres of cord). Just completed the 2080 facet SCK. 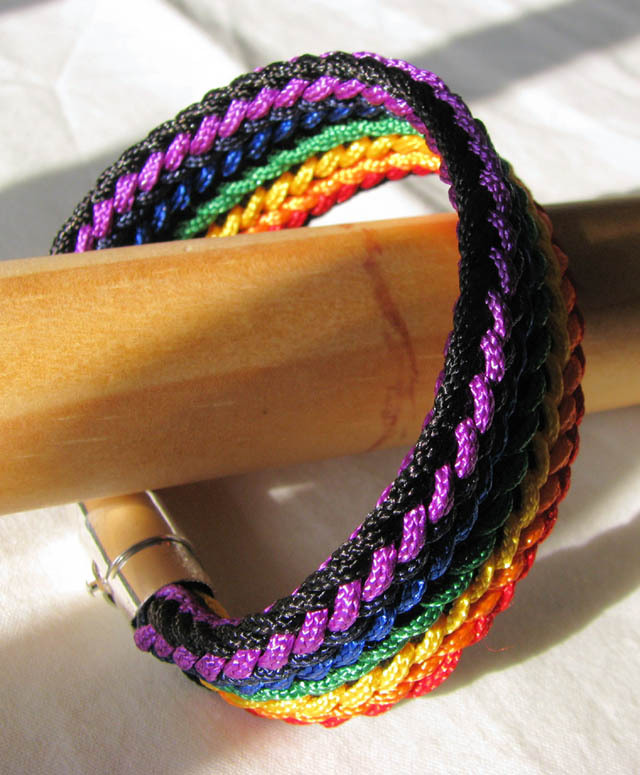 It's made on a 120mm diameter ball using 1.3mm cord. 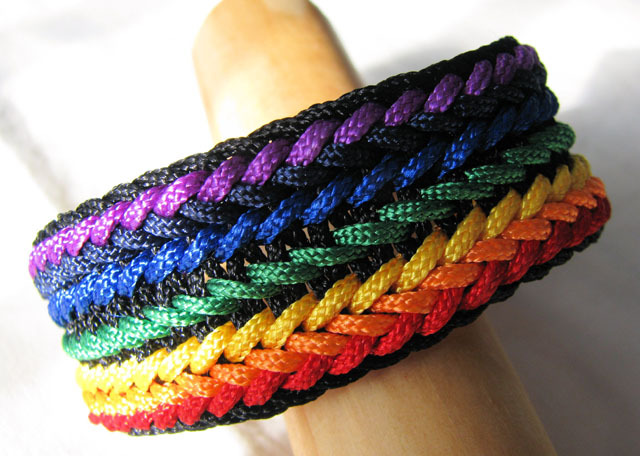 Cord usage is 24metres of each colour. I'm quite chuffed with it ! Good evening Charles, I thought I'd make a series of eggs : 1o 1u, 2o 2u and 3o 3u. On say a 3o 3u egg at the transition from odd to even half period. If 2 of the 'overs' occur on the odd HP then the 3rd over will occur on the even HP. 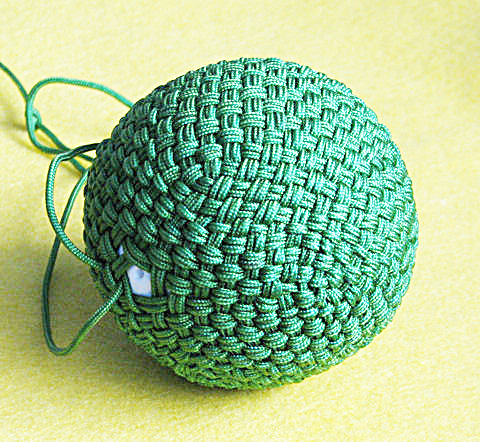 This looks OK on the grid but trying to tie a smooth knot is impossible. If it's 'unders' then the cord is likely to be buried because before and after the pin the last "action" is 'under'. Definitely not a criticism, but an observation that others may want to note. This particular knot is 630 facet, 3 bights in nests of 10; but I'm sure this snag would feature in any multi O/U knot. 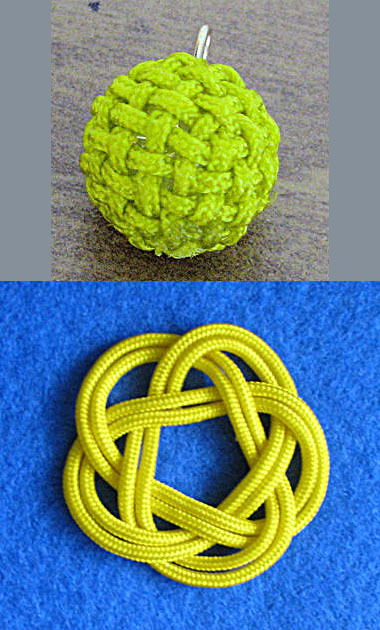 The blue knot is a 2o 2u knot but again 630 facet on a 6cm egg. 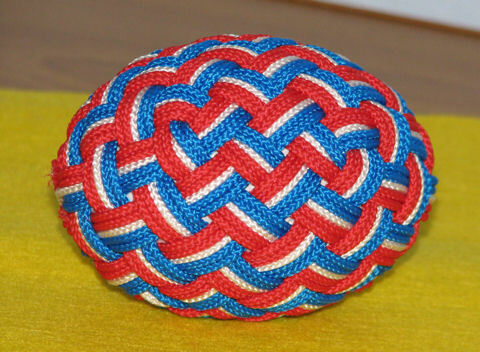 You can see from the photo the comment I made about the 3o 3u knot.........so anyone fancy an omelette ? ANOTHER FABERGÉ egg - luxuous this one ! Another tutorial by exemple given ! Tutorial by exemple given ! Charles, a Fabergesque confection ? 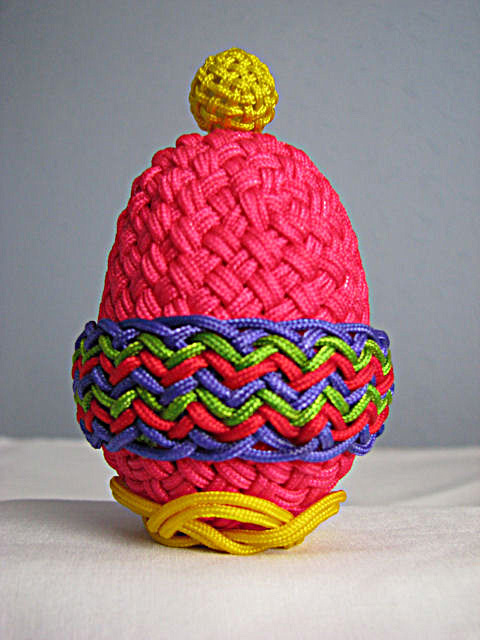 The base is a simple 5 lobe knot stiffenened and shaped to cradle the egg. [open quote]144 facet using 1.4mm cord single ply, on a 15mm diameter bead............very fiddley ! Here is the tutorial John made with ARIANE. 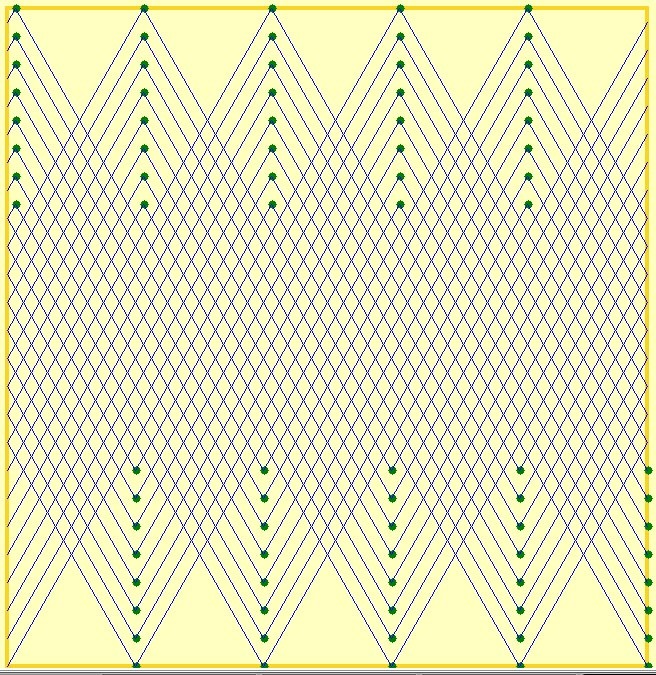 John made a derivation of his 1000 FACEs but this one as polar apertures that are 4-SIDEs instead of 5-SIDEs as in the original 1000 FACEs. John made those using Claude HOCHET's ARIANE program. 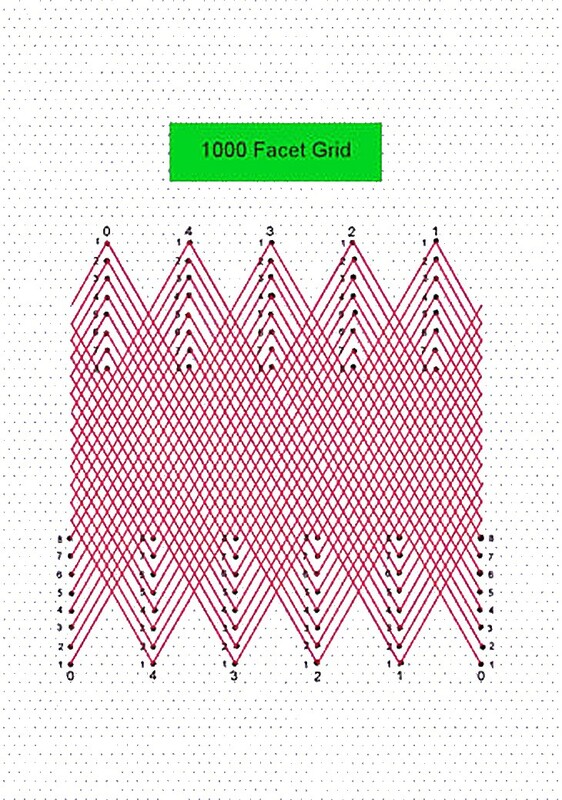 John made ALL of his grids and tables of coding without any help from any program, using " brain, hands, paper and pencil" so there is no 100% guarantee that no typo mistake could have happened despite careful proofing, hence his intellectually honest decision to take off the hand made 1000F tables and just keep the 1000 FACEs grids on line. 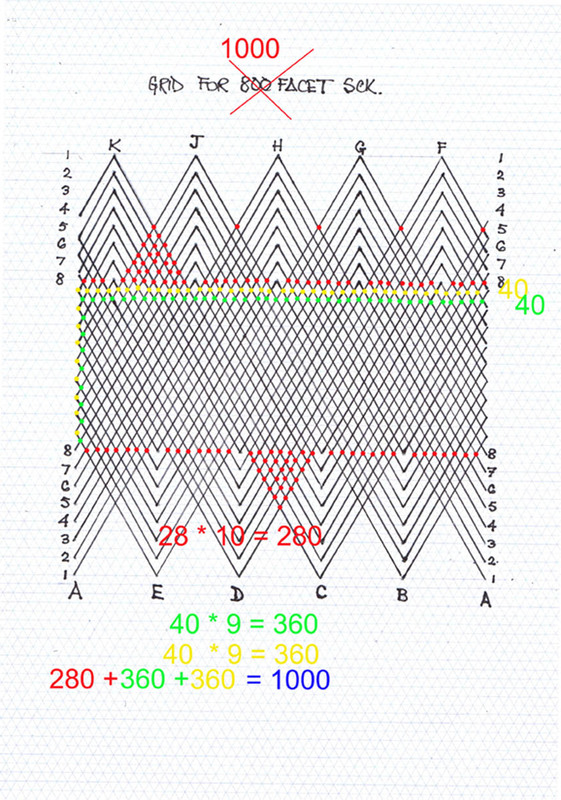 I am putting here the tables of coding generated by the ARIANE program so if a mistake is made it is not John's. 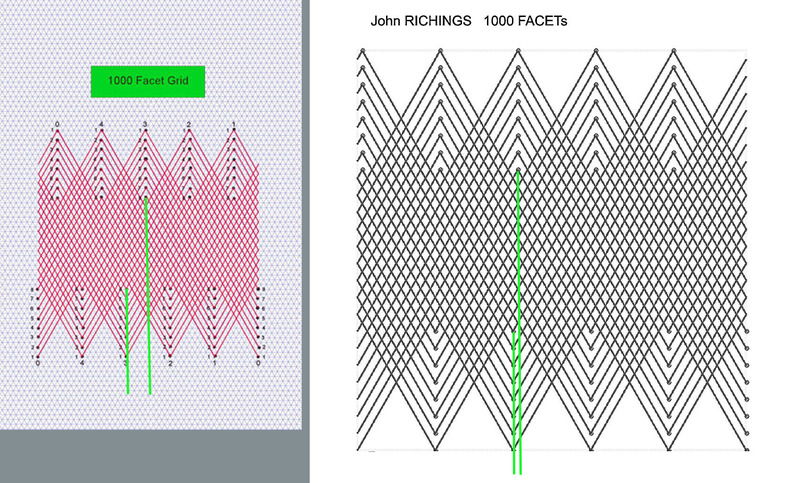 Anyway John proofed "in the cordage" his invented 1000 Faces. 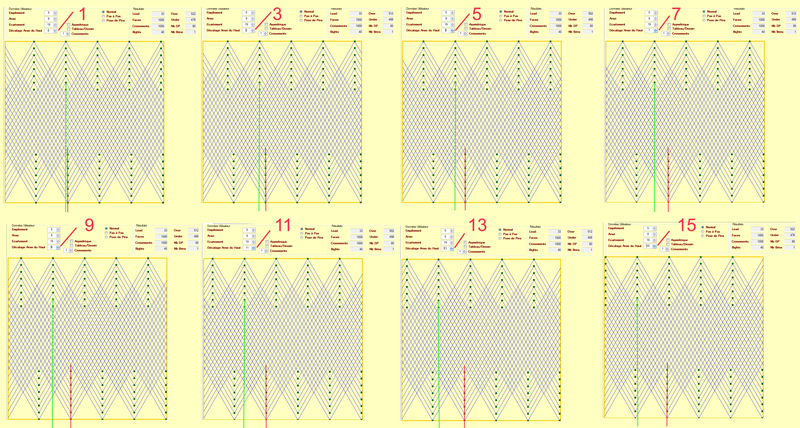 See the 2011 Feb 26th entry and the 2011 Jan 4th one about the grid. 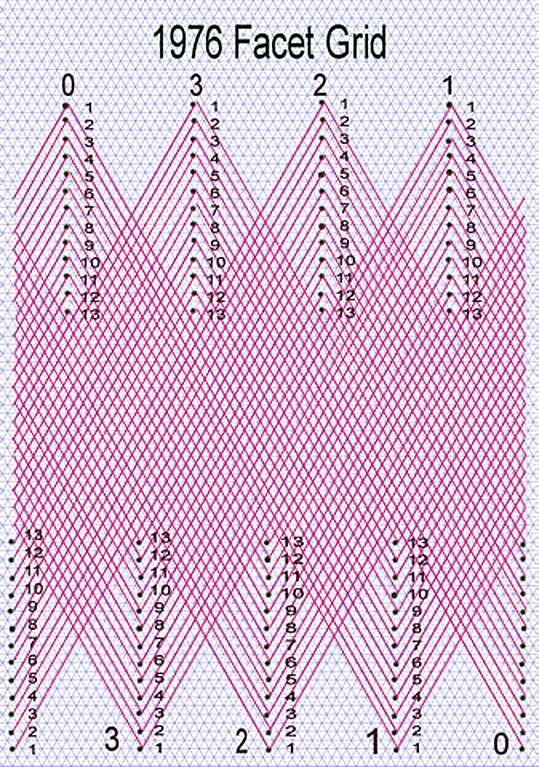 Look at this large illustration to see the influence of the OFFSET. As my late Mother use to say with one of her Burgundy proverbs : "there is no bad that good cannot come of it" : here the 'bad' was the discrepancy and the 'good' is the 'live lesson' on OFFSET importance. If you want the tables of codes made with ARIANE just send a mail. 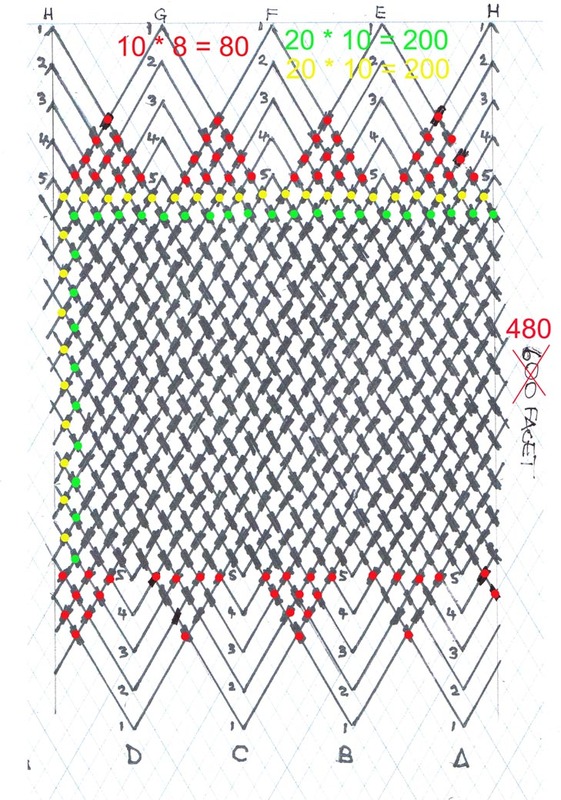 (********this grid does not have the same OFFSET between UPPER KNOT EDGE BIGHT-NEST and LOWER KNOT EDGE BIGHT-NEST. This DOES NOT change the END-RESULT but CHANGE THE CODING OF HP. 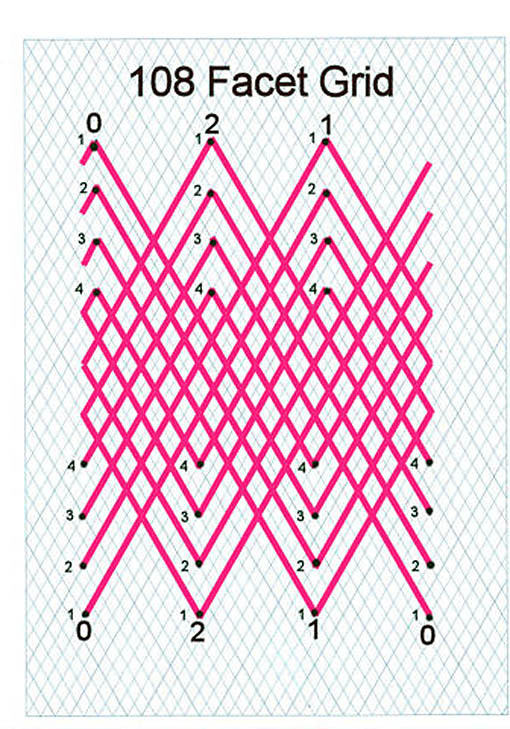 for the fun of showing what Claude HOCHET's new program can do here is the grid that was obtained with in in less that 15 seconds! 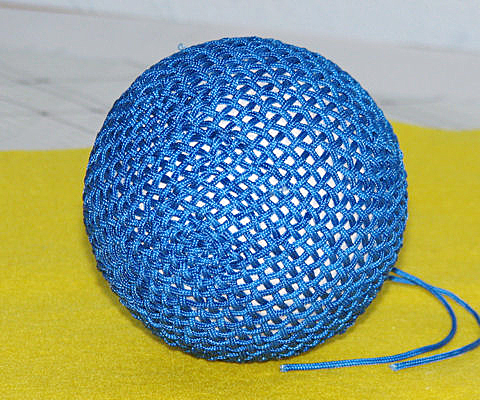 The attached is the closest I could get to a rugby ball. It's only 108 facets and is 3,4,7,1 i.e 3bights, nests of 4, equatorial parts 7 and offset 1. Made on a 80mm x 60mm ellipsoid ? using some horrible stiff shiny 2mm nylon that I bought some time ago. caveat : John made ALL of his grids and tables of coding without any help from any program, using " brain, hands, paper and pencil" so there is no 100% guarantee that no typo mistake could have happened despite careful proofing. JOHN , again, is sharing. 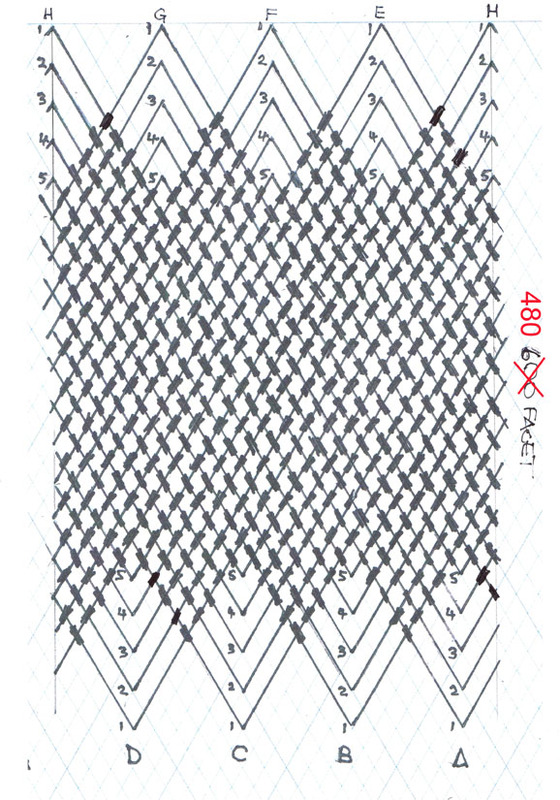 this time a record breaking spherical covering : 1976 FACEs made on a grid of his own invention with paper and pencil, inspired by Nono's creations. 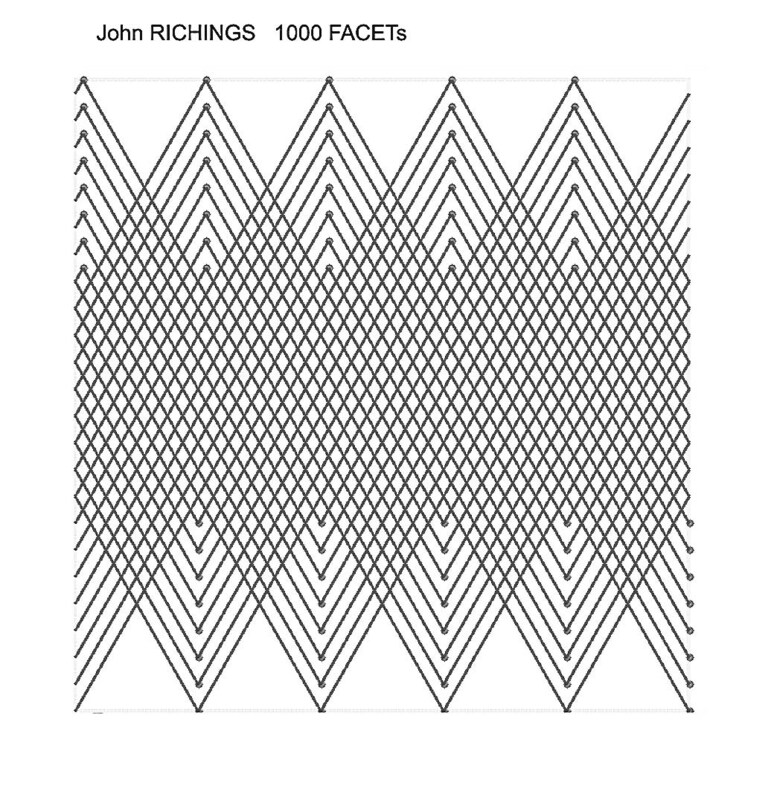 John, 73 is the second first world wide recognized maker of a 800 1000 FACEs. 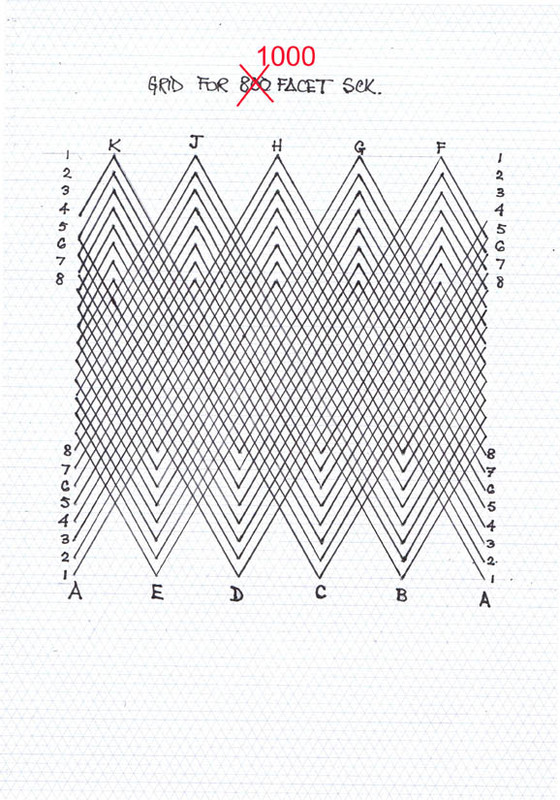 John did not get this grid invented by NONO but he drew it from his analysis of Don WRIGHT's photos.